Bolton Wanderers took another step towards automatic promotion to the Championship with victory at 10-man Port Vale in a game marred by crowd trouble. David Wheater and Gary Madine secured all three points for the Trotters, whose fans brought play to a halt with a pitch invasion following the first goal. The home side had Riginio Cicilia sent off after 33 minutes when he was shown a second yellow card for handball following a foul on Madine eight minutes earlier. Wanderers took the lead after 66 minutes when Wheater rose highest to nod in Filipe Morais' free-kick. In the aftermath, referee Carl Boyeson took the players off the pitch for 10 minutes after clashes broke out between both sets of fans. Madine then doubled the visitors' advantage, sliding home from Morais' pass in the 80th minute, but Wanderers' celebrations were put on hold after Fleetwood's late win at Gillingham. Match ends, Port Vale 0, Bolton Wanderers 2. Second Half ends, Port Vale 0, Bolton Wanderers 2. Substitution, Bolton Wanderers. Conor Wilkinson replaces Gary Madine. Foul by Ryan Taylor (Port Vale). Attempt saved. Gezim Shalaj (Port Vale) right footed shot from more than 35 yards is saved in the top centre of the goal. Substitution, Port Vale. Gezim Shalaj replaces Chris Eagles. Substitution, Port Vale. William Reeves replaces Jerome Thomas. André Bikey (Port Vale) wins a free kick in the attacking half. Goal! Port Vale 0, Bolton Wanderers 2. Gary Madine (Bolton Wanderers) right footed shot from the centre of the box to the bottom right corner. Assisted by Filipe Morais. Corner, Bolton Wanderers. Conceded by JJ Hooper. Substitution, Bolton Wanderers. Derik replaces Jay Spearing. Corner, Bolton Wanderers. Conceded by Nathan Smith. Attempt saved. Chris Eagles (Port Vale) right footed shot from outside the box is saved in the centre of the goal. James Henry (Bolton Wanderers) wins a free kick in the attacking half. Attempt missed. James Henry (Bolton Wanderers) right footed shot from outside the box is just a bit too high. Goal! Port Vale 0, Bolton Wanderers 1. David Wheater (Bolton Wanderers) header from very close range to the bottom left corner. Assisted by Filipe Morais with a cross following a set piece situation. André Bikey (Port Vale) is shown the yellow card for a bad foul. 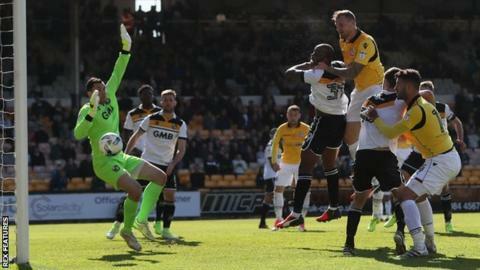 Foul by André Bikey (Port Vale). Attempt missed. Gary Madine (Bolton Wanderers) right footed shot from the centre of the box is just a bit too high. Attempt missed. Chris Eagles (Port Vale) left footed shot from outside the box is just a bit too high. JJ Hooper (Port Vale) wins a free kick in the defensive half. Substitution, Bolton Wanderers. James Henry replaces Jem Karacan. Substitution, Port Vale. JJ Hooper replaces Dan Turner. Attempt missed. Mark Beevers (Bolton Wanderers) header from the right side of the six yard box is just a bit too high following a corner. Corner, Bolton Wanderers. Conceded by Ryan Taylor. Attempt missed. Gary Madine (Bolton Wanderers) header from the centre of the box is just a bit too high.